It was a moment Beau Slocumb’s fans and friends had been praying for all year long. The 24-year-old Juliette, Ga. native was at Atlanta Motor Speedway’s quarter-mile Legends track doing what he does best – driving a race car. Early this year, Slocumb was on the fast track to a professional racing career. Having accomplished about all he could on the short tracks of the Southeast, he packed up to move to Charlotte to chase his racing dream. Sprint Cup driver Ryan Newman, a fishing pal of the Slocumb family, had offered a room in his home until Beau could make permanent arrangements. He took the physical exam necessary to run in the ARCA race at Daytona and in the course of the test a mass was detected in his lung. The diagnosis was Synovial Sarcoma, a tough-to-beat form of cancer. Slocumb’s racing friends rallied to his side, and their efforts showed that even the most hard-nosed, tough characters in the sport have hearts of gold. Some key help came from two people he barely knew – Sprint Cup engine builder Ernie Elliott and former NFL coach and part-time racer Jerry Glanville. They helped Slocumb get started quickly with treatments at the University of Texas MD Anderson Cancer Center. Elliott was familiar with the particular form of cancer that Slocumb had. His son Casey died from it. Glanville was familiar with the cancer center through charity work he did while coaching in Houston. Friends and fans kept up with him through a blog. His girlfriend, Jessica Pitts, was there with him every step of the way. Recently he returned home to a large celebration. Ryan Newman taped a video message that was shown to the crowd. Slocumb began riding a bicycle to regain his strength. He’s up to four miles at last count. “I’ve still got a long ways to go,” he said. 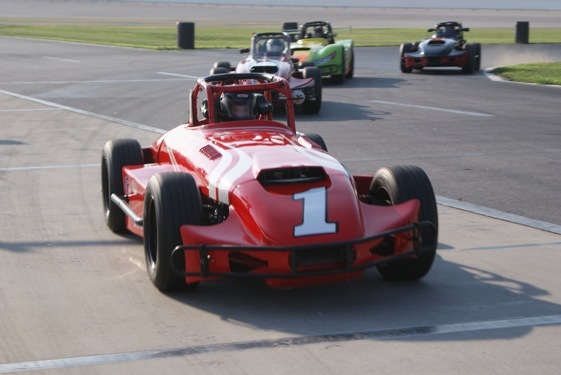 A few days ago, AMS president Ed Clark sent word that Slocumb could drive his Thunder Roadster in the season finale of the tracks’ Thursday Thunder Series. Clark is a lot like Sprint Cup driver Tony Stewart in that he has a lot bigger heart than he’d sometimes like for everyone to know. But he was there on Thursday, after spending the preceding days tuning on the car with the help of several old friends including Gene Roberts, a one-time crew chief for Bill Elliott’s Cup team. “I think the world of that kid,” Roberts said as the two discussed chassis adjustments and changing track conditions. Slocumb, whose hair is just starting to grow back on his head, drew the pole for his heat race and sped away to victory. For Clark, who finished second in his second car in another event, it was a time to smile even though he just finished his first season in years without a summer series victory. “It was as much fun as winning a race to see the smile on Beau’s face when he got in that car for the first time,” Clark said. Between the heat and the feature event, Slocumb worked on his car up to the last minute. Former Nationwide Series driver Joey Clanton stopped by to consult and wish him well. “I’m just glad to see him looking good and getting his strength back,” Clanton said. “He’s fighting this thing, and running this race is a proving point for him. Clanton, who has worked with Slocumb in the past, said that he believes the young driver has what it takes to make it in one of NASCAR’s elite divisions. When the feature started, Slocumb’s talent soon showed. He led from the start and put on a spirited battle with several of the track regulars in the early laps. Clark, standing behind the pit wall, watched intently. “Don’t wreck my car,” he said one time as Slocumb went wheel-to-wheel with a competitor into a turn. Later he said, “Way to drive that car in there,” when Slocumb made an inside move in the tight Third Turn. But midway through the race, Slocumb’s brakes began to fade and he dropped to third at the finish. Still, he was all smiles and looking plenty fit in the inspection area afterwards. His girlfriend Jessica, who had been there through all the ordeal in Texas, was as happy as if he’d won. “I was just glad to see him wearing his firesuit again,” she said. Newman was informed of Slocumb’s performance on Friday at Watkins Glen, and the smile on his face nearly said it all. Oddly, despite all the help Newman has been to Slocumb over the years, including traveling to Georgia for a fund-raiser, he’s never seen the young driver race in person. “I’m always doing this,” Newman said with a smile. This was an awesome article! Thank you for following Beau. He is very dear and special to all his fellow competitors and friends. I love to see his smiling face at the track. You nailed it when you said Ed Clark doesn’t want anyone to know he has a BIG heart, because he really does. When I saw Beau at the track in Ed’s car Wednesday, practice night, I went over and asked him what and the world was he doing in a racecar. He gave me that BIG smile and said “Driven”. I could see the glow coming off the HALO on top of his head. Ed was checking with Beau to see how the car was driving for him and I looked at him in amazement…he had a smile as BIG as Beau’s. What an AWESOME sight it was to see Beau in the car again. He is such an INSPIRATION to me!